Holiday LGBT Friendly Apartment for rent situated in the excellent location right in the Heart of Torremolinos Night Life and next to all amenities, as supermarkets, shops and restaurants. It can offer 2 bedrooms, 3 balconies with coffee tables, 1 bathroom, a fully equipped kitchen, high-speed Internet, TV and air conditioning. The beach is in 12 min. walking. The apartment is on the 3d floor with access via elevator. Sleeps 4. The kitchen is fully equipped offering microwave, big fridge, stove, toaster, coffee machine, water boiler and washing machine. Dishware, cookware, bed linen and towels are provided and included. The living room features a dining area sits 4, comfortable sofa, TV, air conditioning and a balcony with outside furniture. 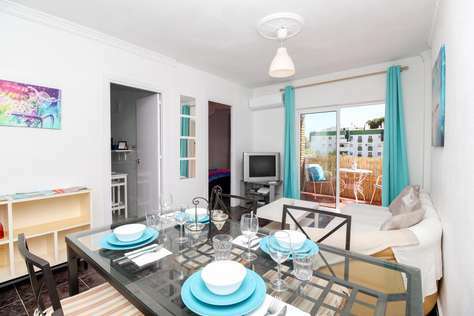 The apartment is situated in the centre of Torremolinos having supermarkets, bars, restaurants, clothes and souvenir shops, beauty salons, night clubs and public transportation in minutes` walk. Perfect place for families, since Torremolinos can offer many types of entertainment for little ones, as a minigolf park near the beach, a crocodile park where you can hold baby crocodiles, the Aqualand water park, the Battery Park with a lake where you can take a boat, as well as many open playgrounds.